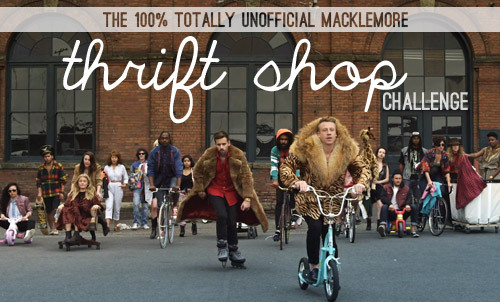 The Happy Homebodies: Macklemore Thrift Shop Challenge! When I saw this Macklemore Thrift Shop Challenge from Young House Love, I just knew I had to participate! No one has ever had to ask me twice to go visit the thrift store, I'll tell you that. Treasure hunting is definitely my idea of a good time! The challenge comes from the lyrics of the song. 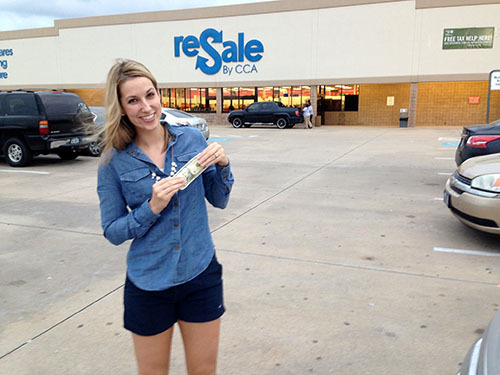 First you have to put $20 in your pocket and head to the thrift store. Next, find an item from the song. 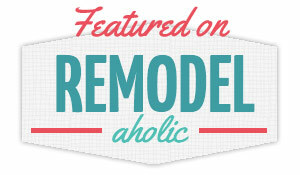 Last, buy something cool with your $20 and share it on your blog! 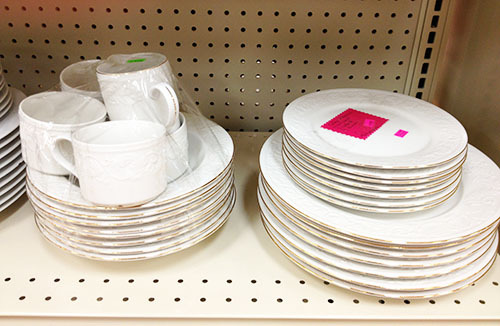 I dragged my husband to our local thrift store to help me document the trip. Here we go! Then I had to find something from the song (big coat, moccasins, keyboard, kneeboard, PJs with socks, luggage, shoes with velcro, etc). The item I found is not necessarily a kneeboard, but we figured it was close enough. 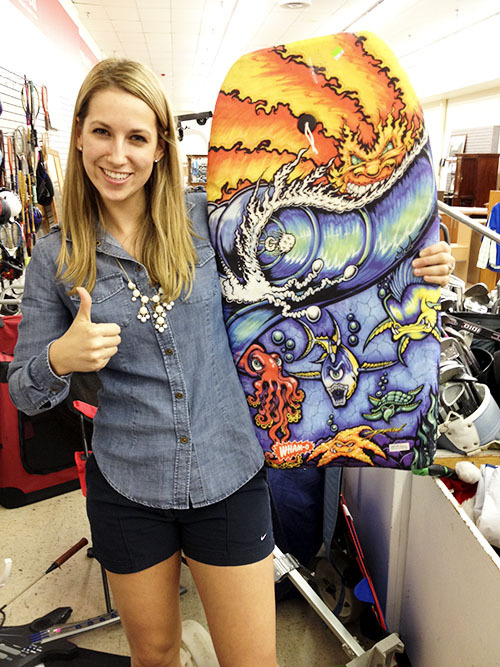 Behold, a crazy bright boogie board kneeboard! Yikes... thrift store lighting is not the best. Once those requirements were met, the hunt was on to find something cool with my $20. I thought it would be fun to show you all the items I considered buying and see if you could pick out what I actually bought. Let's see the options! First up, a giant wooden storage trunk. 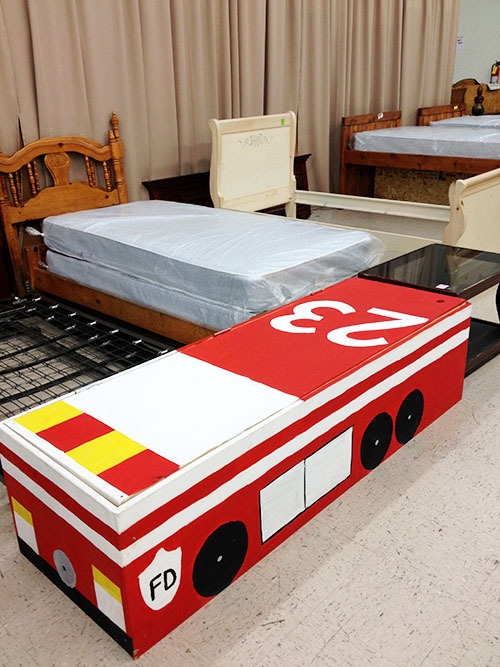 Clearly made for a little boy's room, but who doesn't need storage? It could easily be painted and even upholstered. They wanted $20, and it was 6 ft long. 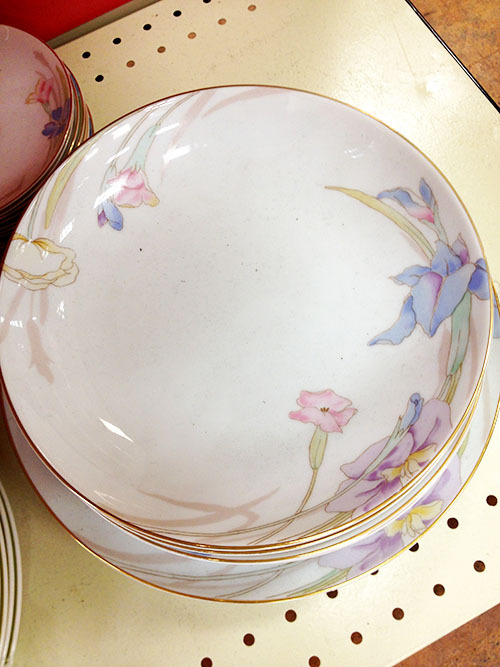 Next, I looked at some sets of watercolor china and gold-rimmed china. Both together were under $20 and each included 20+ pieces. I've had great success with buying china at this thrift store, like my gold greek key set! 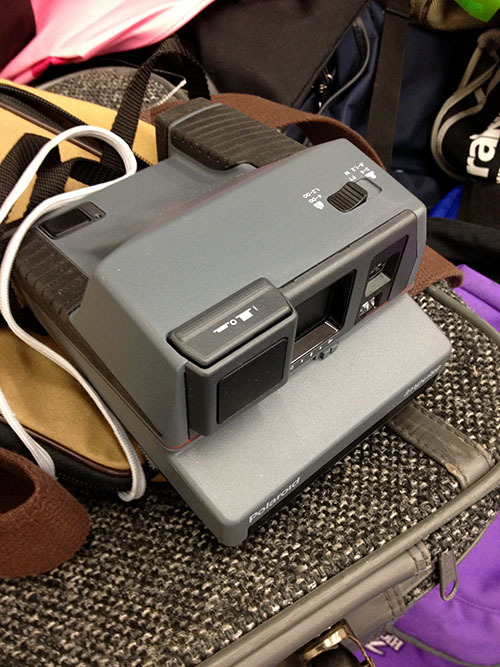 Then I looked at a camera bag with Polaroid camera from 1992, instruction manual and Polaroid greeting cards. Vintage polaroid cameras are selling for $140-$160 at Urban Outfitters right now. 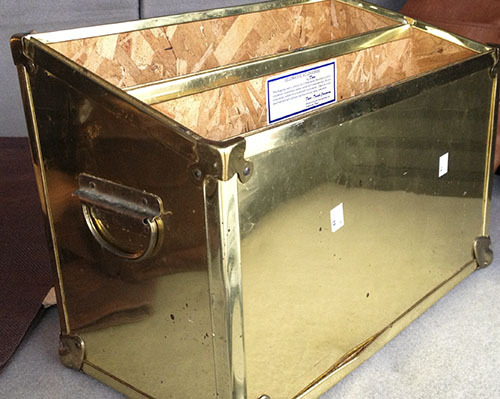 I spotted this brass magazine rack and thought it had potential. Brass seems to be all the rage right now, and I've seen it all over Pinterest. Not perfect condition, though. Right next to the boogie board was a wall full of tennis, racquetball and badminton racquets. 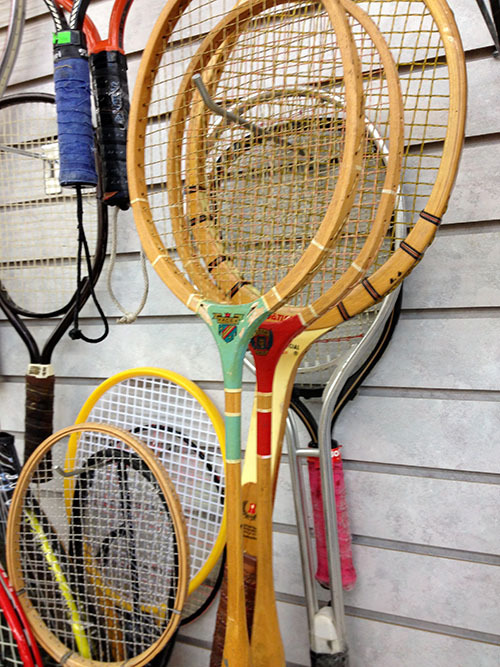 I was charmed by these vintage badminton paddles with great color. They would look grey hung on the wall in a group– maybe something like this or this? Wat do you think I bought with my $20? I'll be back tomorrow to show you what I got and what we did with it!